This has been quite a weekend for the Bennett family and defensive basketball. 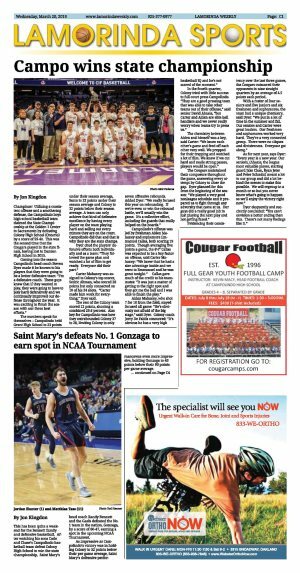 After watching his sons Cade and Chase's Campolindo basketball team defeat Colony High School to win the state championship, Saint Mary's head coach Randy Bennett and the Gaels defeated the No. 1 team in the nation, Gonzaga, by a score of 60-47, earning a spot in the upcoming NCAA Tournament. As impressive as Campolindo's victory was in holding Colony to 32 points below their per game average, Saint Mary's defensive performancewas even more impressive, holding Gonzaga to 43 points below their 90 points per game average. Bennett appreciated how special the weekend was: "It was one of the best four days of my life. Seeing my kids and their friends win the state championship and then defeating San Diego and Gonzaga, it's been an unbelievable high." 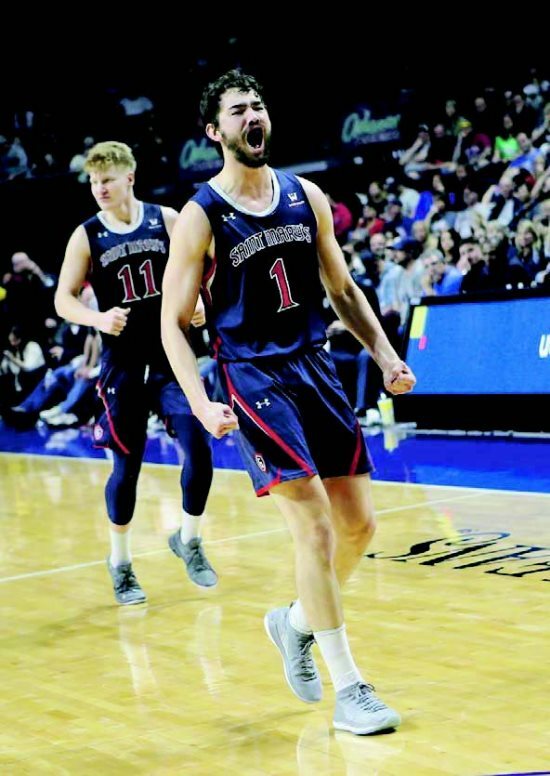 This was the first time that Saint Mary's has defeated a No.1 ranked team in the nation after losing 10 previous times, going back to 1955 (Gonzaga-3, Arizona-1, San Francisco-6). Center Jordan Hunter, who was named the tournament's Most Outstanding Player, scoring 12 points and grabbing 15 rebounds versus Gonzaga, claimed after the game that the victory was never in doubt: "We knew going into the game that we were going to win it." 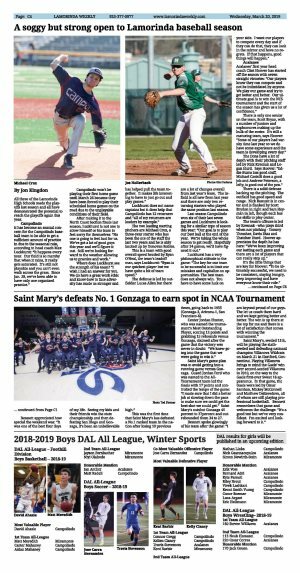 Saint Mary's game plan was to avoid getting into a running game versus Gonzaga. Guard Jordan Ford who was named to the All-Tournament team led the Gaels with 17 points and controlled the tempo of the game: "I made sure that I did a better job at slowing down the pace to make sure we could get the best shot we could get." Saint Mary's outshot Gonzaga 45 percent to 37percent and outrebounded them 34 to 27. Bennett spoke glowingly of his team after the game: "I am beyond proud of our guys. The let us coach them hard and we kept getting better and better. The win is up there at the top for me and there is a lot of satisfaction that comes with winning the tournament." Saint Mary's, seeded 11th, will be playing the sixth-seeded and defending national champion Villanova Wildcats on March 21 in Hartford, Connecticut. Playing Villanova brings to mind the Gaels' win over second-seeded Villanova in 2010, on the way to the Gaels first-ever Sweet 16 appearance. 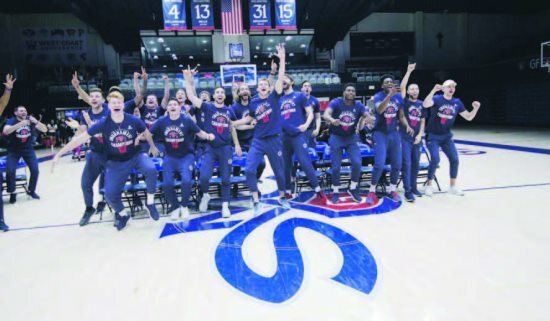 In that game, the Gaels were led by Omar Samhan, Mickey McConnell and Matthew Dellavedova, all of whom are still playing professional basketball. Bennett remembers that game and welcomes the challenge: "It's a good test but we've very confident. I'm excited and looking forward to it."